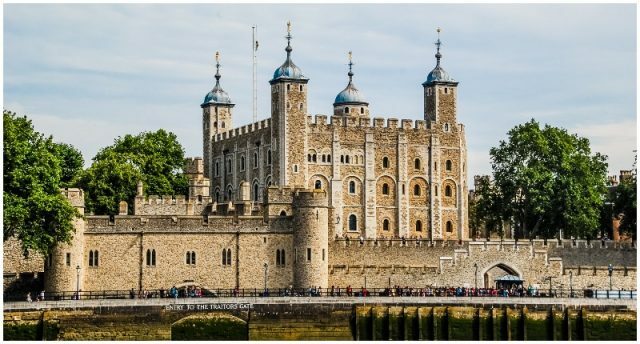 One of the iconic images of London and the United Kingdom, the Queen’s Guard adorn everything from tourist photos, to postcards, to biscuit tins. 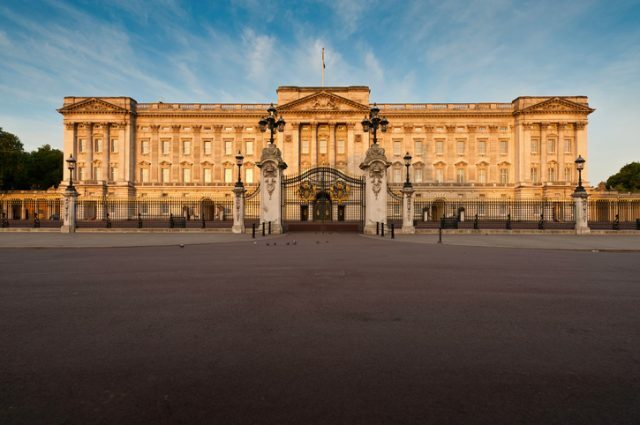 For decades they’ve captivated visitors from across the globe to become a tourist attraction in their own right as they present arms, march to and fro, or stand guard outside Buckingham Palace. 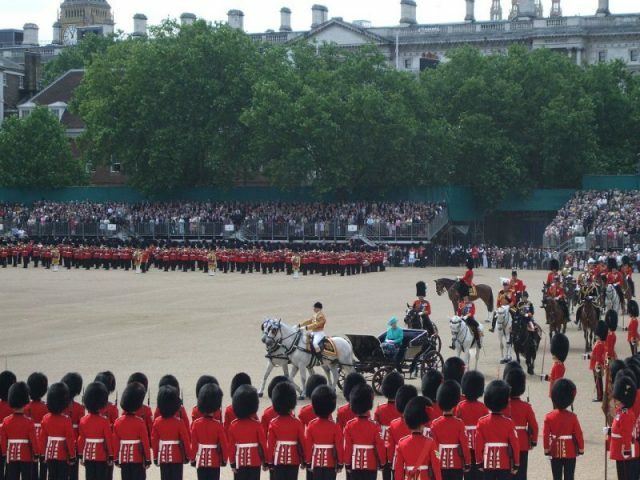 Traditionally the protection of Queen Elizabeth II and her London residence, Buckingham Palace, is the duty of the Queen’s Guard. Rather than being a ceremonial regiment like the pike-wielding Yeomen of the Guard or the feathered Royal Company of Archers (the UK has no shortage of this sort of thing), this is a designation given to combat troops who perform this role as just another operation, much like deployments overseas or combat operations. Though the role is traditionally fulfilled by the Horse Guards and the Foot Guards, mounted and infantry regiments who have been awarded special guards status in the past, other regiments are now often called upon for this special duty. In 2007, for the first time, seamen of the Royal Navy served as the Queen’s Guard, rather than being represented by the elite Royal Marines. 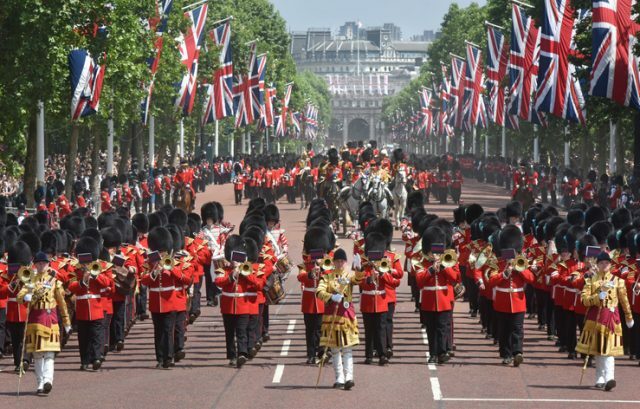 The regiments of the Foot Guards are the Grenadier Guards, Coldstream Guards, Scots Guards, Irish Guards, and Welsh Guards, and the Horse Guards, or Household Cavalry (as in the ‘royal household’) are the Life Guards and the Blues and Royals (Royal Horse Guards and 1st Dragoons). 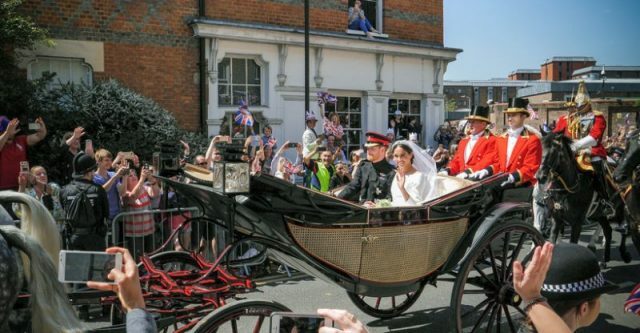 At the 2017 wedding of Prince Harry and Meghan Markle, both Harry and Prince William wore the dress uniform of the Blues and Royals. The crimson-clad men who took pride of place in last year’s tourist selfie might well be in battledress today. Though in real terms the protection of the Royal Family and their residence is the responsibility of a special armed unit of London’s Metropolitan Police called Royalty and Specialist Protection (RaSP), the Queen’s Guard are still soldiers and although their guns are most likely unloaded, they will still respond to threats as best they can. 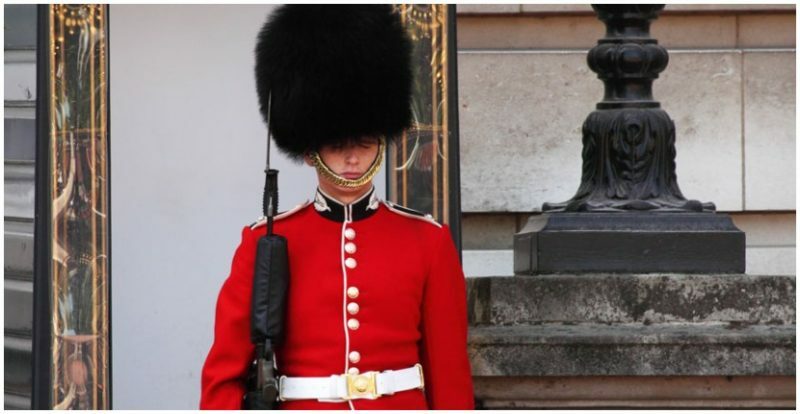 The duty of the Queen’s Guard is to protect all the residences of the British monarch, so while they’re mostly associated with Buckingham Palace in Central London, they can also be seen at Windsor Castle, St James’s Palace, or the Tower of London. In Scotland’s capital Edinburgh, the Queen’s Guard can be found at Palace of Holyroodhouse and Edinburgh Castle, but unlike the London locations where they are on duty all year round, they only stand guard when Her Majesty is actually in residence. 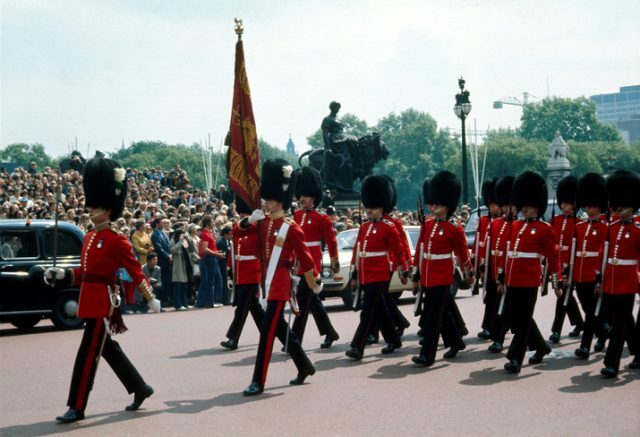 London, England, UK, 1973: Changing of the Guards. Members of the Queens Guard regiment marching in front of Buckingham Palace. Although Queen Elizabeth II is the head of state of the United Kingdom, she fulfills the same constitutional role for 15 other counties — called Commonwealth Realms — including Canada, Australia, and New Zealand. Oaths of Allegiance taken by servicemen in the Commonwealth Realms are often sworn not to serve the government of the day, but to serve the monarch. 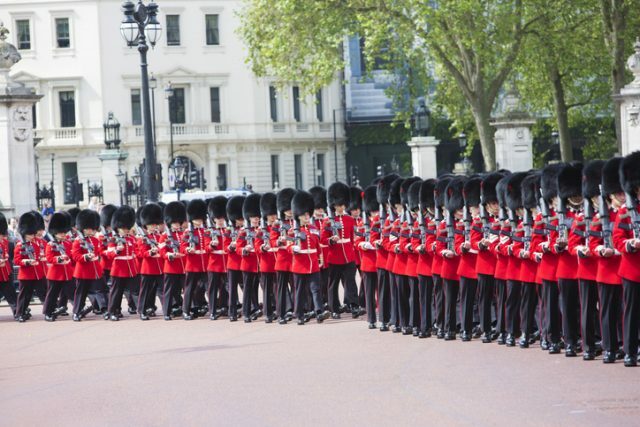 As a result, it makes perfect sense for these loyal troops to serve in the Queen’s Guard. After all, she’s their queen too! Some recent “foreign” regiments to have served as the Queen’s Guard are the Royal Canadian Regiment (October to November 2018), the Royal Malay Regiment (April 2008) and 1st Battalion, Jamaica Regiment (July 2007). It’s also common for Commonwealth citizens to serve in the British Army under the same principle, as the opportunities and pay are often better than those of their sometimes smaller and less prestigious armies, particularly in places like the Caribbean. As of 2018, an estimated 4,500 Commonwealth citizens were serving in the British Armed Forces — most of them in the army. It’s something of cliche to take a grinning selfie next to an expressionless guardsman — but while they look like a living, breathing visitor’s attraction, these are active duty servicemen and they are expected to comport themselves with absolute discipline. If they are caught laughing or smiling by a superior officer they are fined around ₤200 (approximately $260) from their pay. Shift change of the Queens Guard guarding gate to Buckingham Palace. They protect royal residences in London and the whole monarchs family. 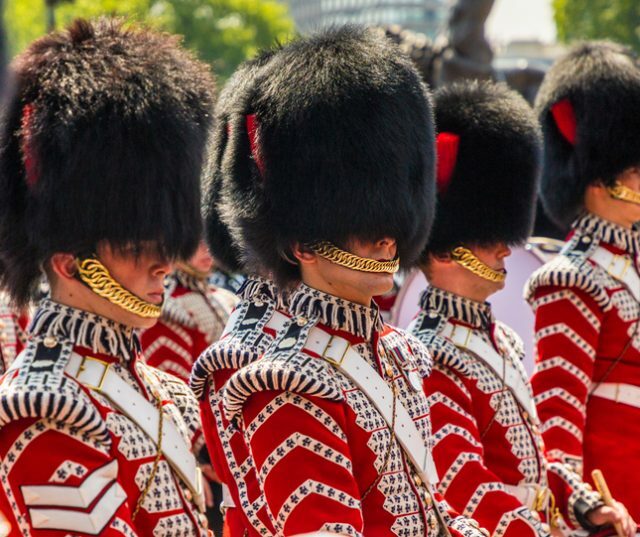 It’s not often you get an opportunity to quote Toy Story when writing about military discipline, but the demands of standing to attention in the sweltering summer sun whilst wearing a heavy bearskin helmet are so likely to result in fainting that the Queen’s Guard are instructed to faint in a certain way. As soon as they feel light-headed, they are expected to maintain their impeccable composure and “faint to attention,” which is why you sometimes see photographs of fallen guardsmen lying face down and ramrod straight. 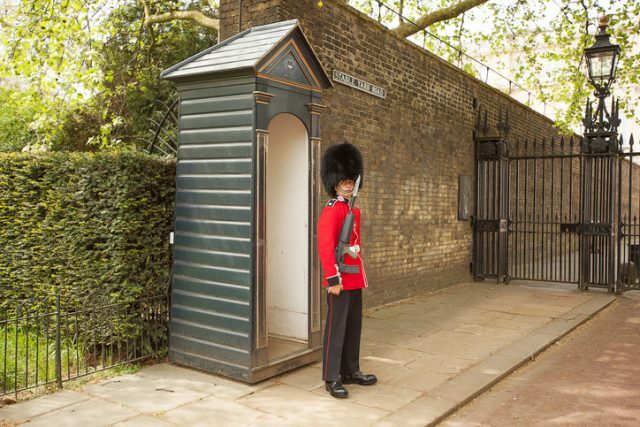 While their discipline may prevent them from leaving their posts, the bladder discipline of the Queen’s Guard can leave a lot to be desired. Though they’d prefer to ignore you and remain totally expressionless, they are permitted to react if they need to. 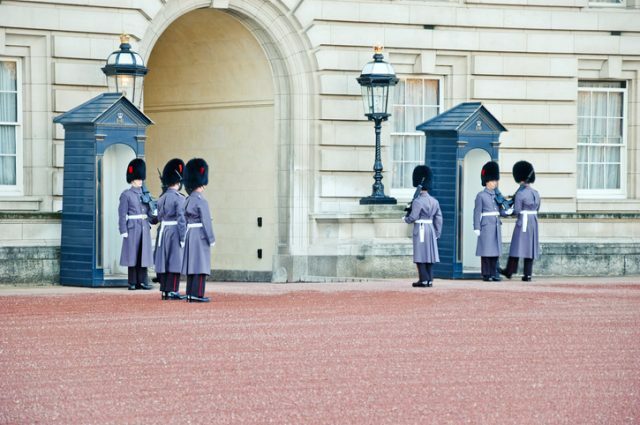 If members of the public are obstructing them in their duties, the Queen’s Guard are allowed to shout commands — such as “Make way for the Queen’s Guard!” — or even shove people out of the way if they’re not paying attention. If someone is perceived as being aggressive or threatening, they are allowed to point their rifles in warning — they might not be loaded, but the bayonet is still wickedly sharp, and you don’t want to test the patience of a highly trained British Army infantryman. 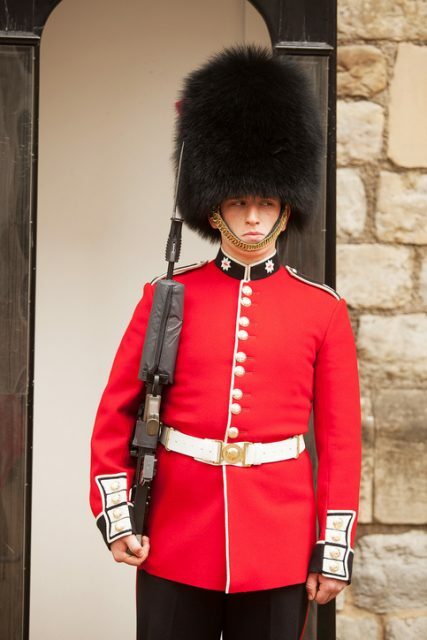 Not all of the Queen’s Guard wear the iconic black bearskins. These are part of the ceremonial uniforms of the Guards Regiments and other regiments serving as Queen’s Guard may have different ceremonial uniforms, so try not to be too disappointed if you come across a Scottish Glengarry bonnet, shorter fur busby, or peaked cap instead. The 18-inch tall bearskins may look impractical, but that’s because they’re designed to intimidate by adding to the soldier’s height. 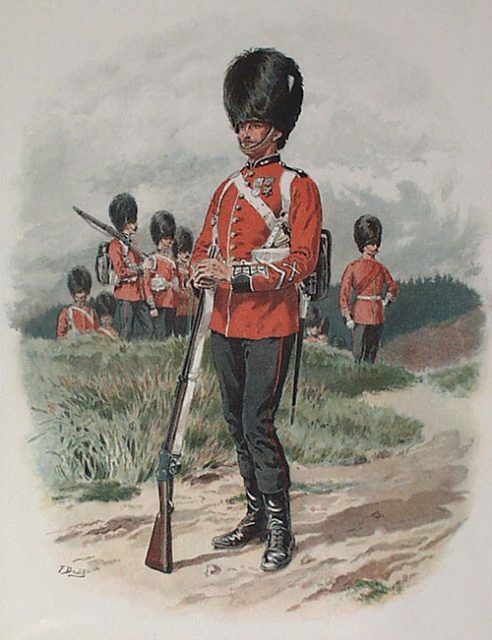 Traditionally worn by French grenadiers, they were adopted by the British Grenadier Guards following their victory over the French in 1815 and soon spread to other Guards Regiments. Traditionally made from the fur of the Canadian black bear, the bearskins last for decades so replacing them is infrequent. Due to ethical concerns, new helmets are made with fake fur. The weight of the bearskin can present a risk, however. They make a tempting target and they’re so heavy that they could easily break the guard’s neck if shot or struck, so in combat situations, the soldiers are instructed to fit the chinstrap below their nose. Better a broken nose than a broken neck, right? They may not smile, but the Queen’s Guard can still enjoy a lighter moment. 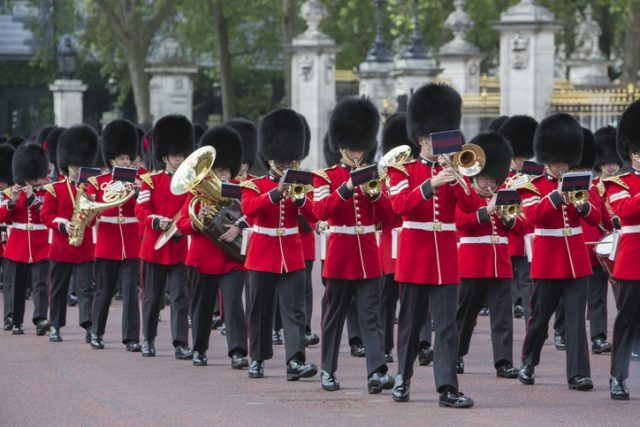 The regiment on duty are always joined by their regimental band to take part in the larger ceremonies such as the changing of the guard, and it’s not uncommon for them to play something other than patriotic songs and regimental marches.